Federal Hill Home Theaters is a Warwick, Rhode Island based company that you can trust to make your media dreams come true! We service all of Southern New England. We work with clients to create a vision unique to their styles and personalities. The TV installation packages we offer are 100% GUARANTEED and INSURED. With over 2,500 TV’s installed and counting we have encountered every type of wall (brick, stone, plaster, metal studs, concrete, etc). 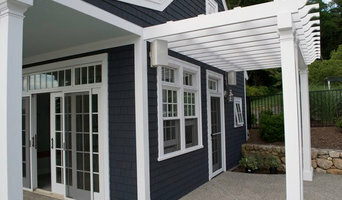 Our owner began as a Tweeter Installer for the Commonwealth Ave Brookline MA store. He has trained our installers to come prepared with anything and everything they will need for the job. We make sure your TV will be placed exactly where you want it and operating to its full potential. If you aren’t quite sure about the placement let us suggest the proper height and viewing angle for your new TV. Our job is not done until you are completely satisfied! We offer full-service Audio / Video Sales, Design, Delivery, Wiring, Installation, & Service Calls! 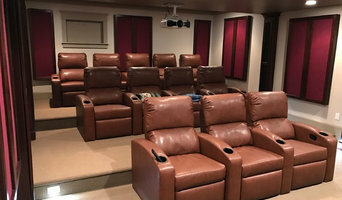 A home theater system can be as basic or complex as you desire: from flat panel TV mount, LED wall-mounted televisions with an advanced quality sound system, to ultra high-end home theater rooms with fashionable reclining theater seats, a universal projector mount, a home theater projector, multi-room audio, a wall-sized screen, or a lighting control system with automated shades and curtains. Imagine your home theater delivering the equivalent of a commercial movie theater, and all that is left for you is to grab a friend, popcorn, soda, and enjoy the show! Audio, Video & Technology: Home theaters, Sound, Design Installation and Consulting, Origin Acoustics, Yamaha, SONY, URC, Triad, Lutron lighting & Shades. Elite Theater provides expertise in delivering high quality award winning audio-visual installations. Elite Theater is oriented so that you will have complete satisfaction throughout the life of any product or services purchased, from the initial design concept through installation, and beyond. We strive to give client’s audio, visual, and complete piece of mind as a means to enjoy, relax, and immerse yourself in the highest of quality products and services in an environment that is honest, friendly, and truly in a professional manner. We believe in servicing after the sale and provide continual service and support to our clients that demonstrate our commitment to their ongoing satisfaction. We pride ourselves on the ability to cater to a wide range of installation needs with high quality and personal service along with a vast product lineup. We are incredibly passionate about what we do, a passion that exuberates from every detail of every installation. In an industry where technology moves so quickly, it’s nice to know you will have someone in your corner each step of the way. Whether it’s just to point you in the right direction, or complete system design and implementation, Elite is glad to help. We just don’t sell, service, and install our products, we surround our self’s with the technology and trends so you don’t have too. Each installation receives the same intimate and personal commitment regardless of size or budget. We will work hand in hand directly with you, your builder, or subcontractor every step of the way. Elite Theater has been devoted to serving our customers since 2005. Let us put our experience to work for you. Ron Snell Audio Video has been a leader in home integration specializing home theater, home automation, and more — staying on the cutting edge of technology while meeting the ever changing needs of our customers. Our goal is to provide you the service, the entertainment, the technology, and most importantly, the controls to allow you to easily enjoy your living environment to the utmost. All installations are performed by professionally trained and certified installers. We recognize the special care and attention to detail needed when building your dream home. Expect the best, call us today! For Home Audio, Home Theater and Home Automation choose Natural Audio. We’ve been designing, installing and maintaining high quality systems in CT for over a decade. The options that are available to today’s homeowners are incredible. Now is the perfect time to let the professionals at Natural Audio create the audio, video and automation systems that you and your family deserve. HiFrame designs are elegant pieces of functional art. When your television is turned off it is concealed into unique, luxury mirrors complementing the design of your room. HiFrame designs are hand-crafted from the finest frame styles and highest quality mirrors available to blend seamlessly with your decor by our artisans in a variety of styles and colors. Utilizing the finest artisans in the industry, we'll help bring your imagination to reality with our highly customizable options for video concealment. We work alongside your contractors and interior designers to ensure the final design suits YOUR taste. We offer a variety of frame and mirror styles, built-in flush mounting options, LED displays, and custom colored glass. We are even able to accommodate outdoor settings with our weather protected screen options. These are just a few of the dramatic options for your new high-tech indoor or outdoor space. The possibilities for displays up to 100" diagonal are truly limitless. We appreciate your interest in HIFRAME! We are confident that by experiencing our product in-person at one of our two galleries in Watermill, NY (Flagship) or Hicksville, NY, you will truly appreciate the many solutions we provide for your home. Call or e-mail today to request a private viewing and feel free to have your designer, architect or general contractor join us! What we do is make technology livable. Our corporate name Robert Saglio Audio / Video Design dates back to the heyday of custom home theaters (and we still do that). But today most of our projects involve whole-home networking and automation, lighting and shade control, remote home monitoring, and energy management as well as providing access to music and video throughout the home. Our professional team will custom design your screening room, complete with superior picture and sound, to complement your living or workin space with a seamless finish. We deliver and install everything from in-wall, surround sound speakers to wall-mounted televisions, leaving you with an optimal system perfectly suited to your personal style. We design, engineer and install luxury home theater, audio/video and home automation solutions. Founded in 1995 by James Shapiro and Allan Waldorf, Audio Video Intelligence is approaching its twentieth year of operation. Willing to take on any electronic endeavor no matter how great or small, residential or commercial, and we will work with you to design a system that fits any architecture, application, or budget. Our innovative showroom is full of design ideas and, as always, our friendly staff is here to assist you with any questions you may have. Our company is headquartered in Easton, MA, only a half hour south of Boston and about forty minutes north of Providence, RI. 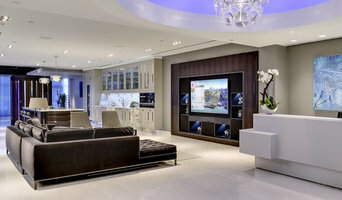 Our innovative showroom showcases some of the most popular electronic equipment used in our theater installations and gives our customers the ability to view high-end electronics in an actual living environment. The showroom consists of several full-functioning living spaces, including home cinema, gaming theater, bistro bar, and living room vignette. Incorporated in 1956 Mulholland Audio/Video is a family owned and operated business. We design, sell, and install custom commercial and residential audio/ video systems: i.e., Home Theaters, Whole House Audio, Lighting Control, Security Cameras, and Total home integration. We also provide your business with the latest technology in Board rooms and Conference rooms, Commercial Music systems. Our technicians are manufacturer trained. They have stringent requirements in area of equipment, knowledge, training, and experience. We are fully licensed in RI and Massachusetts. Mulholland Audio/ Video has the facilities to work with your architect, designer, or builder, providing them with detailed blueprints that incorporate our equipment into your plans. This service also gives the client a permanent record of their wiring. Adobe Cinema & Automation is an award winning comprehensive electronic lifestyle management company, providing luxury residential electronic systems and management services to discerning clientele. Our continued growth is due to our success to execute targeted initiatives that have led to long-term client relationships and cultivating our reputation as the premier electronics contractor in both the mid- and high-end residential markets. We invite you to see why discerning clients select Adobe Cinema & Automation as their 'electronic lifestyle management company. Trademark AV Systems is a full service audio video integration company specializing in high end residential projects. In business since 2015 Trademark AV is owned and operated by Tim Mahoney, Tim has worked in the Custom Electronics industry since 1995 having worked for some of the areas best AV Integrators and Home Builders. Mancaves has been providing Southampton home automation systems such as audio, video, control networking, automation, and CCTV solutions to residential and commercial clients since 1999. We have assembled a team of designers, architects, and technicians who are highly qualified and experienced in all aspects of your project design and Southampton home device installation. Our expert staff will work with you through every phase of construction of our home automation systems in Southampton. We design and program our Southampton home automation systems to ensure that they are seamlessly integrated into your custom environment. Our Southampton home devices and designs will provide you with high efficiency as well as add value to your property. We consistently stay on top of technology so you do not have to. We assure you that our designs and home devices in Southampton will be programmed by highly skilled and awarded veteran programmers. We proudly serve Amagansett, Battery Park, Bridgehampton, East Hampton, East Quogue, Gramercy Park, Montauk, Morningside Heights, Murray Hill, Napeague, North Haven, North Sea, Northwest Harbor, Noyack, Quogue, Remsenburg & Speonk, Sag Harbor, Sagaponack, Shelter Island, Shinnecock Hills, SoHo, Springs, Southampton, Sutton Place, Tribeca, Tuckahoe, Wainscott, Watermill, Westhampton, Westhampton Beach, Yorkville, and surrounding areas. Home media specialists not only can design the seating and decor for your dream home theater, but most of them can help you find specific media control options, conceal your television and various accessories, set up optimal seating, choose and install ideal lighting, and help create the ultimate viewing environment. Some of these Rhode Island professionals work entirely on their own, while others work with subcontractors to get the job done. Here are some related professionals and vendors to complement the work of home automation & home media: General Contractors, Interior Designers & Decorators, Paint & Wall Covering Dealers, Furniture & Accessories, Specialty Contractors. Find a home media designer on Houzz. 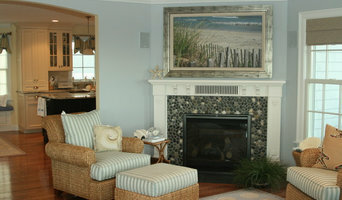 Narrow your search in the Professionals section of the website to Narragansett Pier, RI home media designers. You can also look through Narragansett Pier, RI photos by style to find a room you like, then contact the professional who designed it.